Hannah from The Bridal Dance tells us about her new business. Tell us about your business. When did you start it and what is it all about? The company has just been launched in the last couple of weeks. 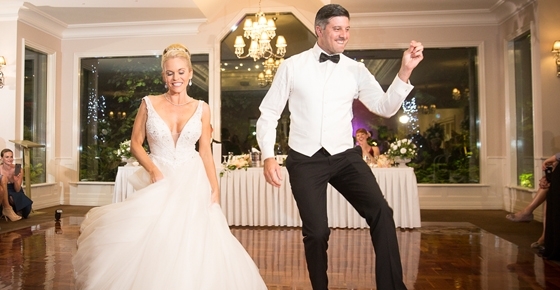 We provide dance lessons for couples all over Melbourne who are getting married. In just one lesson, we can provide enough advice and teach some simple steps that even the most nervous of dancers will feel confident. What we love to do more than anything, is to create unique, fully choreographed dances for couples to the song of their choice. No two dances are ever the same, and this can be taught in just a few lessons. The Bridal Dance is a completely mobile business. We travel to our clients, to teach them in the comfort of their own homes after hours and on weekends. We also provide lesson notes and video feedback after every lesson to help couples learn the steps. It couldn’t be easier, and no previous dance experience is needed. I have danced since I was three, and when I was 15 left home (in NZ) to accept a position training full time with The Australian Ballet School. Dancing is in my DNA with over 30 years experience. For the last 7 years my day job has been working as a medical rep in Croydon, but have decided to go back to my roots of dance and teach. When I got married I taught my husband our wedding dance on the cricket pitch at Tintern College (much to the amusement of passers by). This was the catalyst to launching The Bridal Dance. Why did you choose to start/locate your business in Maroondah? I bought my house in Ringwood East 6 years ago. I love the Maroondah area in general. Working close to home is a bonus. What is your favourite thing about Maroondah? Maroondah has beautiful leafy suburbs, which you just don't get the closer you get in to the city. It also seems to be very progressive at the moment, with new infrastructure going in including the upgrade of Eastland. What is your favourite Maroondah place to grab a bite to eat or drink? Hands down Jimmy Grants at Eastland. My husband and I regularly pop up for "The Greek Feast"
What other City of Maroondah businesses inspire you? Where possible I always shop local. I do all the supermarket shopping at The IGA in Ringwood East and I love that they still have a personal touch. Often I see staff helping people with their groceries to the car. I am also inspired by the trendy businesses that are starting to pop up everywhere. Outer east residents no longer need to travel out of Maroondah to get some fabulous meals and shopping. What business tip would you give to others?